Before investing time in shopping for solar panels, most consumers want information about the costs, benefits, and feasibility of solar for their specific property—information that they can evaluate quickly to decide whether or not to move forward with the shopping process. 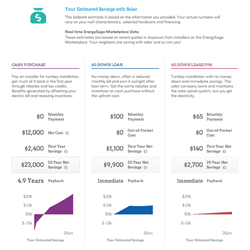 In response to this need, online solar marketplace EnergySage today launched its “Instant Estimate” feature. With the “Instant Estimate” any home or commercial property owner in the U.S. can get estimates of solar’s costs and benefits under various financing options for their specific property. The process takes less than one minute to complete and is not connected to any lead generation or sales activities so using the tool doesn’t result in any pressure to buy or annoying sales pitches. The analysis that generates the instant estimate leverages some of the industry’s leading tools and databases, combined with EnergySage’s proprietary market price data. It's a powerful tool that enables the mass-market consumer to evaluate the impact of solar power at his or her property. Consumers get answers to key questions in the comfort of their own home without the need to engage with a solar installer/sales person. Using EnergySage’s proprietary market price data, EnergySage provides property owners with an informed cost estimate for a solar panel system that would meet 100% of their electricity needs, adjusting for all available rebates, tax breaks and incentives available to the property owner. The “Instant Estimate” also shows the costs and savings associated with various financing options, for example, if the consumer buys the system outright with cash or finances it through solar loans or solar leases and power purchase agreements (PPAs). And, in a growing number of markets, EnergySage leverages remote site suitability data from industry leading tools to estimate the size of system that will fit a particular roof. Using information about the shading and roof structure of the specific property, EnergySage provides an estimate of how much electricity can be generated on site and the percentage of electricity need that would be met. By the end of 2014, site suitability data will be available for more than 50 million properties across the U.S. Using the tool requires property owners only to provide an address, identify the property type (residential, commercial or non-profit), and enter information about their electric bills. This information is used only to generate the instant estimate for the consumer and will not result in any sales calls or pressure to move forward. Development of the Instant Estimate tool was funded in part through a Department of Energy Sunshot Initiative Award in October 2013. The U.S. Department of Energy (DOE) SunShot Initiative is a collaborative national effort that aggressively drives innovation to make solar energy fully cost-competitive with traditional energy sources by the end of the decade. Through SunShot, DOE supports efforts by private companies, universities, and national laboratories to drive down the cost of solar electricity to $0.06 per kilowatt-hour.